There is a big difference between writing a book and writing a blog. 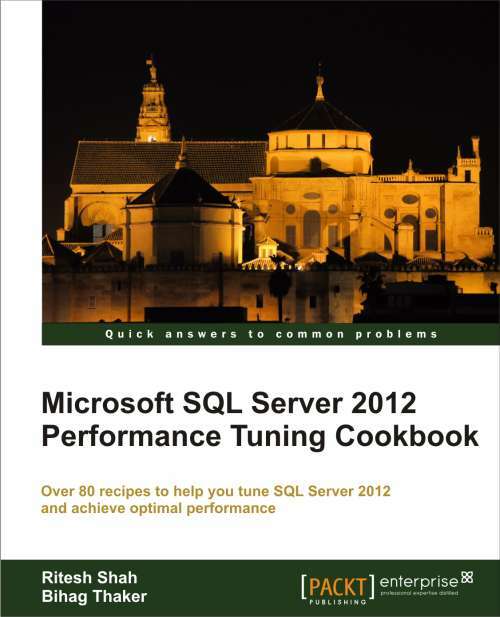 I understand this when I have started writing a book “SQL Server 2012 Performance Tuning Cookbook”. As soon as PACKT proposed me to write the book on this subject, I have started deciding the topics to cover in this book with my co-author Bihag Thaker. It was a big challenge to decide the content of this book because performance tuning is a big topic and covering all aspects under the one book is little difficult but finally we have managed the book in three following parts. Each topic covered the practical recipe for hands-on experience of the readers. PACKThas conducted my interview regarding my journey of this book writing process. Further reading the interview, please click here. 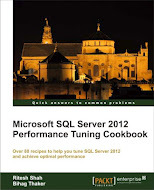 This entry was posted in SQL Server 2012, SQL Server Performance Tuning and tagged author, Microsoft, Ritesh Shah, sql server 2012 performance tuning cookbook on September 3, 2012 by Riteshshah. As a database professional, we might come across in situation where we need to compare data row by row or column wise between two tables which either resides in same database or in same instance or may be in different instance in different server. What do you in this situation? 1.) Do you write down script of your own? 2.) Do you use any third party software? 3.) Do you use “TableDiff” utility comes with SQL Server itself? Third option, out of all of the above, seems good to me as we neither need to invent the zero again by writing down the script by our own nor we need to pay extra money to compare data. “TableDiff” is one of the wonderful and oldest utility provided by Microsoft. It works fine with SQL Server 2000 to the latest SQL Server edition. However, I am providing you the script and example from my SQL Server 2008 instance. Before you move forward, you need to find out two tables whose data you wanted to compare. It might be in publisher/subscriber in replication, it might be in two different databases you are using for scale out or may be anywhere else. If you don’t have this situation at the moment in your environment, don’t worry, I will be giving a script to raise the scenario to test “TableDiff” utility. 4.) 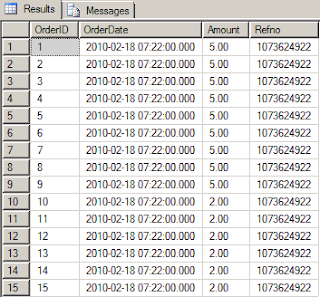 Creating “Orders” table in second database by copying 900 records (out of total 1000 records) from “Orders” table from “TableDiffDB1” database by using following script. 5.) Now use following command to see the difference between two tables. Replace your server instance name in “SourceServer” and “destinationServer” parameter in above given command and you will get one .SQL file in D drive. 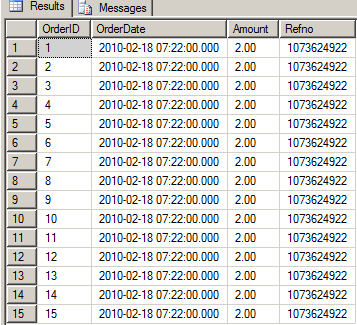 Running that SQL file will insert all missing records in “Orders” table of “TableDiffDb2” database as it shows you the list of all missing records there. I would like to draw your attention to some of the facts which can help you if you don’t find “TableDiff” working in your environment. Remember that “TableDiff.exe” file resides in installation directory of SQL Server by default which is “C:\Program Files\Microsoft SQL Server\100\COM” in my case. So, there is chance that “TableDiff” command is not accessible via DOS prompt, you have to set path for “TableDiff” in “ServerVariable”. If you find any path under “PATH” in “ServerVariable”, you can put “;” (semicolon) after that path and can add your path for “TableDiff”. Generally people tend to use “TableDiff” from DOS prompt itself or via .bat (batch file) file but I have used “xp_cmdshell” extended stored procedure to show the use of command right from SQL Server but there may be a chance that “xp_cmdshell” is disable in your environment. If your security constraint allows, you can enable “xp_cmdshell”. For more details about the steps, click here. This entry was posted in sql server, tablediff, xp_cmdshell and tagged Microsoft, Ritesh Shah, SQL Server, sql server 2008, tablediff, XP_CMDSHELL on July 18, 2012 by Riteshshah. NOLOCK hint in SQL Server, Good guy or bad guy? It is quite often in production environment that multiple application and/or users try to access same resource at the same time which may create locking and blocking issues. It is tricky to deal with this situation as there is no rocket science which suits for all situations. It is all depends on situation because in some production environment, it is not possible to resolve blocking issues easily over the night. The main root cause for locking is, we have long running transaction which keeps your object locked and meanwhile any request comes to access the same object, has to wait until the current transaction complete its operation. Best choice should be to minimize the transaction length so that it releases the lock quickly and other request doesn’t need wait due to lock but unfortunately it is possible to solve it easily in ALL environments. I am going to perform this example in my SQL Server 2012 RTM version but it may work as it is in SQL Server 2005 / 2008 too. 3. Execute one UPDATE statement in Win1 with BEGIN TRANSACTION. Note that we don’t have COMMIT or ROLLBACK after the UPDATE Statement at the moment. ROLLBACK is commented so it won’t be executed. 7. We can see that out UPDATE statement runs with SPID 54 and SELECT statement runs with SPID 55. SELECT query is blocked by SPID 54 given in row no.2 column no.5 in screen capture. Now I have two ways. Either I issue COMMIT / ROLLBACK command which is not a good idea to interrupt UPDATE or cancel SELECT query in SSMS which I will do now. 8. Since we have cancelled SELECT query, we will not execute same SELECT statement with NOLOCK hint. 9. Here is the result return by above query. 10. Go to Win 1 and execute “ROLLBACK” statement. When we have executed UPDATE statement in Step no 3 without COMMIT or ROLLBACK, It updates the records but didn’t release the lock it has acquired on the table so SELECT query was not able read data and return it. How do you know that whether UPDATE has really updated the values or not? Since our select query is not giving results. We have executed same select query with “WITH (NOLOCK)” hint in step no. 8 and we can confirm that values are update with the screen capture given in step 9. Isn’t it good situation? Yes, may be as we were not even able to get the result of SELECT statement in step no 4. But I would say we can’t decide whether it is a good or bad without evaluating the business need. Since UPDATE statement has updated the value but it is not saved so there is a chance to ROLLBACK. 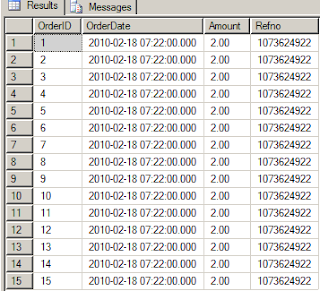 If you see resultset given in steps no 9, you will see “5.00” in “Amount” column which may not be a proper value as after ROLLBACK, it comes back to “2.00” again as per step no. 12. Think if this would be a result of stock exchange, what would happen? Can we run with dirty read we seen in screen shot in step no.9? No certainly not that is why I have conveyed that NOLOCK is all depends on the business need and situation. Use it wisely as it is two sided sword. NOLOCK as known as READUNCOMMITED concept is somehow related to ISOLATION level. Here are the links of some of my past article on the subject. Find locked table in SQL Server. This entry was posted in NOLOCK, sql server and tagged deadLock, Microsoft, MS SQL Server, nolock, Ritesh Shah on May 4, 2012 by Riteshshah. My previous article was on Compilation & Recompilation of Stored Procedure. After reading that article, two of my reader sent me an email about more clarification on some terminology and that is the base of writing this article. Actually SQL Server Query Optimizer is really one of the smart tools which used to find or generate best execution plan for query or stored procedure and make the task easy for DBA. Basically it uses Cost Based Optimizer (CBO) to do this task, even sometime feels to have specific Execution Plan for query so Microsoft have provided many different hints at different level. Query Optimizer (QO) used to save execution plan when it compiles Stored Procedure first time and use the same execution plan when the same stored procedure is being used again so that you can get rid of overhead of generating execution plan again and again. When index statistics changes heavily, QO used to recompile the statement to get best plan for your stored procedure but if you are sure that the existing Plan would works fine than one should go for OPTION KEEPFIXED PLAN for that statement so that you can save your resources and boost up performance. 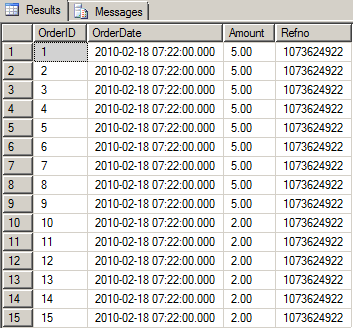 I will demonstrate this with few queries run in SQL Server Management Studio (SSMS) and capture the results in Profiler. 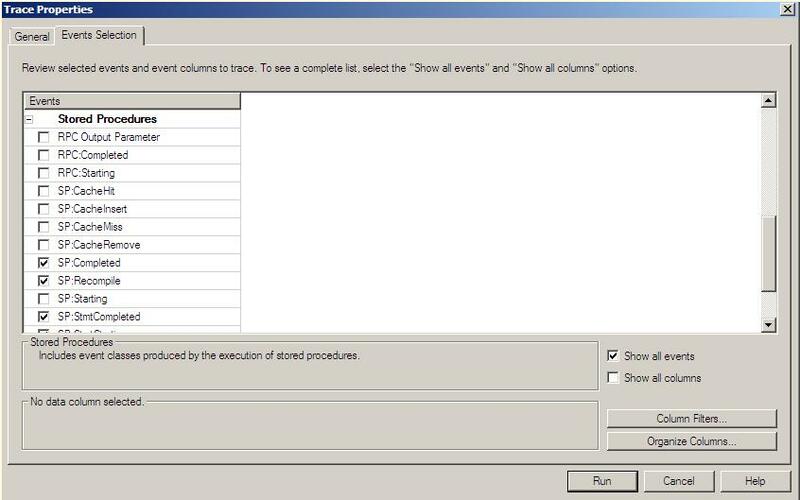 I will select following Events in Profiler while creating new Trace for my server. Now, make change in Index statistics by inserting so many records in table so that we can test the effect in profiler after executing SP again. Now, if you see the profiler, you will see “SP:Recompile” event as your statistics are updated so it need recompilation of statement. If you again few more thousands record in same table and execute the same SP again, you will see recompilation again. Now, after droping table and SP, we will make one small change in Stored Procedure and will use “KEEPFIXED PLAN” hint so that we can avoid recompilation. After recreating table along with fresh records, we are going to see what happened while executing SP in above statement. Since our table now has only 1 record so it is time to change statistics with bulk insert as follows again. Here is the screen capture of Profiler which doesn’t show Recompilation. You can even add few more thousands of rows and execute SP again, you won’t get recompilation. This entry was posted in OPTION KEEPFIXED PLAN, sql server, SQL Server 2012 and tagged hint, KEEPFIXED PLAN, Microsoft, MS SQL Server, Ritesh Shah on November 2, 2011 by Riteshshah. I generally ask one question in interview “If we have one complex query which JOIN five table, what would work best from .NET application, Call of Query or Stored Procedure?” 80% of candidate used to say “SP works fast”. My next question always would be “WHY?” than out of those 80%, 60% would say “Because SP is a compiled code”. After that I fire my follow up question, I can see option of “Compile page or project in .NET but I never see that kind of option in SSMS, how do you compile your SP?”, once I EXECUTE this question, 90% candidate of those 60% candidate would like to keep silence or divert the talk. Anyway, intention of this article is to let you know some facts about SP compilation & Recompilation. Since it is big topic and wouldn’t cover under on article, I may come up with some more articles on this topic but right now, let me explain some basic facts only. First of all, let me tell you that you don’t need to compile Stored Procedure manually, when you execute it, SQL Server will compile your Stored Procedure for you and save the execution plan for future use so that it doesn’t need to compile again and again, this is generic understanding, it doesn’t work all time as few facts are there which cause recompilation many time or every time. If you want to recompile your Stored Procedure manually, you should use “SP_Recompile” Stored Procedure given by SQL Server. Now, you think if recompilation is that bad than why Microsoft has given facility to recompile? Well, let me have an opportunity to break the ice, recompilation of stored procedure is not always bad. It may be beneficial or may be harmful, it is totally depends on the situation. Actually compilation of Stored Procedure stores the execution plan first time you execute your Stored Procedure and every follow up call would use the same execution plan but recompilation of SP would be helpful if you have new statistics or new index on the table. BTW, in SQL Server 2008+ there is in-built functionality to recompile at statement level rather than recompiling whole stored procedure which is less resource centric. Following is the list of basic cause which forces Stored Procedure to recompile. “Deferred object resolution”, means object was not available while compiling Stored Procedure but you have created later on, may be some temp table you have created in Stored Procedure. Call of “SP_Recompile” Stored Procedure. 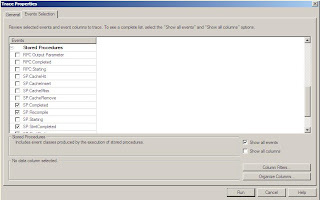 Call of RECOMPILE clause in Stored Procedure. How to avoid Stored Procedure recompilations? Avoid using temp table or other DDL statements as long as possible. Avoid changing SET option in Stored Procedure like ARITHABORT, Quoted_Identifier, ANSI_NULLS, ANSI_WARNINGS etc. Avoiding recompilation by statistics change by using “KEEPFIXEDPLAN” hint. Disable Auto Update statistics for your database. Well, these are very basic understanding and each point of this article may consume separate dedicated article and I may come up with series on this very soon. This entry was posted in sql server, SQL Server 2012, Stored Procedure Compilation & Recompilation and tagged Microsoft, MS SQL Server, Ritesh Shah, stored procedure on October 31, 2011 by Riteshshah. I have already written a small script to fix orphan userswhile moving database from one server to another server but the major problem is, that script just auto fix the login but can’t have login with the same password which old instance/server was having. This entry was posted in transfer login and passwords and tagged login, Microsoft, MS SQL Server, Ritesh Shah, user on August 5, 2011 by Riteshshah. This entry was posted in database backup and tagged database backup, Microsoft, MS SQL Server, Ritesh Shah on August 1, 2011 by Riteshshah. Today once again I felt to write something about Index, so open up the list of Index articles I have written, find out the topic which are still missing for concept of Index and thought to write about fill factor. Generally, when you create an Index, your data get stored in B-Tree format where you can find “Root Page”, may be “Intermediate Page” and “LEAF Page”. “Leaf Page” would have your actual data sorted in order of Index key and each “Leaf Page” would be of 8KB. When you insert/update/delete data to/from table, it tries to insert in the proper data page according to the record you are inserting. For example, you have Index on SSN number you are inserting new row with SSN number, SQL Server tries to insert that record in the appropriate page, suppose your SSN starts with “2” so it will find what is the last page which has SSN number starts with “2”, SQL Server will insert your new row in that page only. If your 8 KB page is full and don’t have room to accommodate new row whose SSN starts with “2”, it will split page and the data in that page will be shared between two pages so now you have two pages which are half full so your row will be accommodated in that page. If your page would already had space for accommodating new row, you wouldn’t need to wait for extra I/O overhead and wait until page split gets finish and space for your row would become available. This is the time when FillFactor comes into the picture. Fill Factor decides how much your page would be filled up initially. Suppose you give 10 in FillFactor than your data page will consume only 10% of your 8KB page size and when you exceed this limit of 10%, it keeps 90% page empty and create new page for other records. Now, when you insert new records, you don’t need to worry about I/O overhead of page split as you would have 90% free space and your record will be accommodate in that space easily. So, if you have lower number of Fillfactor, you can decrease I/O over head generated by Page Split which helps you to write your data faster. Now, you might be thinking now that why shouldn’t I use low number always like 5% or 10% in Fillfactor? Well, it will decrease your page split but it will increase number of data page in your index so every time you scan your index, you have to read more pages and it is again over head while reading the data and decrease the speed of reading data. Suppose you have 10 records in one table and its size is 8KB, you can fit all 10 records in one page only but if you have fill factor of 50 than those 10 records will be stored in two pages rather than one while creating an index. Uff, what to do now? if we decrease fillfactor figure, it helps in writing but creates problem in reading and if we increase fillfactor figure may be 100% than helps in reading but creates issues while writing in database? You have to be reasonable and have to take decision based the load on your database, you have to decide first that you have more writes or more read? Personally I majority go for figure somewhere between 80 to 90 for fillfactor so that you have some space remain for new records and decrease page split at the same time, we don’t keep too much free space in data pages so number of pages doesn’t get increased. Even, it is not final figure I use for all my databases, if my database is read only or very rare insert/update, I would go even for 100% Fillfactor and if my database is write intensive, I would have even 50% Fillfactor. BTW, you can define Fill Factor while creating an Indexor rebuilding an Index or you can set default value for fill factor via following T-SQL (by default it is 0 in SQL Server). This entry was posted in Uncategorized and tagged fillfactor, index, Microsoft, MS SQL Server, Ritesh Shah on July 28, 2011 by Riteshshah.